Como podéis suponer el nombre de mi blog ‘From The Blue Side’ está relacionado con el hecho que vivimos en un planeta azul, y ello es debido a que los océanos cubren más del 70% de la superficie de nuestro planeta. El porqué del giňo al lado oscuro os lo contaré otro día. La parte ‘divertida’ de que nos referiramos a nuestro planeta como el Planeta Azul, es que esto es así desde que las primeras imágenes de la Tierra vista desde el espacio nos han convencido de ello. ¿Qué hay de divertido en esto? Pues que hemos necesitado ir al espacio para reconocer la importancia de los océanos en nuestra vida, y sin embargo en el aňo 2000 todavía la mayoria de las áreas del oceáno de nuestro planeta no habían sido muestreadas desde la superficie hasta el fondo más de una vez (Stewart, 2008). As you can imagine, the name of my blog ‘From the Blue Side’ is related to the fact that we live on a blue planet due to the ocean covers over seventy percent of its surface (I will explain you the reference to ‘the dark side’ in the title of the blog in other moment). The funny part that we call our planet the Blue Planet is that we do since the first images of the Earth from the space have convinced us of this fact. Which is the funny part? Well, we have needed to go to the space to realize about the importance of the ocean in our lives, while, by the year 2000, most areas of the ocean had been sampled from top to bottom only once (Stewart, 2008). The hydrothermal activity is associated with the presence of divergent plate boundaries, also known as mid-ocean ridges as that in the mid-Atlantic where the discharge of magmatic material makes the European and American continental margins separate. The presence of fractures in the ocean bottom in these regions enables the contact between the bottom sea-water with the magmatic material below. It makes that the bottom sea-water penetrating along these fractures get very high temperatures (300-400°C) in such a way that when they merge towards the deep ocean again they ascend through the ocean water column due to they are lighter than the surrounding waters. Imagine the chimney of a fabric through which water vapor is released. The water vapor ascends quickly as a white plume that dilutes in the atmosphere until its density is equal to the air at the same level. Returning to our hydrothermal plume, during its ascent, it entrains ambient deep ocean water, colder and saltier, that makes increase its density. This upward movement continues until its density is equal to the ambient water, sometimes several hundred meters above the seabed. Thus, the hydrothermal activity implies a heat injection to the deep ocean, as well as a transport of water masses due to the vertical movements that I have described. The deep water masses in the different ocean basins are very slowly renovated, and, in some places, the transports produced by hydrothermal plumes can be comparable with the magnitude of flows predicted for these basins (Lupton et al., 1985). Pero no es sólo calor lo que se intercambia entre el fondo y el océano a través del agua que penetra y posteriormente emerge a través de esas fracturas, sino diferentes metales y compuestos que se encuentran en distinta concentración en el océano y en el interior de la Tierra. Por ese motivo, la actividad hidrotermal afecta la química del océano (Stein et al., 1995), proporcionando incluso una fuente de energía alternativa que es capaz de mantener ecosistemas únicos que distan a veces entre una zona de actividad hidrotermal y otra. Nuestras ‘nubes’ de agua hidrotermal no contienen oxígeno pero son ricas en ácido sulfídrico (H2 S), el cual puede ser usado por bacterias como fuente de energía para la producción de material orgánica que después mantiene cada uno de esos ecosistemas a pequena escala (Longhurst, 1998). Nevertheless, it is not only heat what is exchanged between the ocean bottom and the water column through the water penetrating and later emerging through those fractures but different metals and compounds that exist in different concentration in the ocean and the Earth interior. For this reason, the hydrothermal activity affects the chemistry of the ocean (Stein et al., 1995), even providing an alternative energy source able to maintain unique ecosystems differing sometimes from one hydrothermal vent to another. Our hydrothermal ‘clouds’ do not contain oxygen, but they are rich in hydrogen sulfide (H2 S), which can be used by some bacteria as energy source to produce organic matter that later maintains each of these small-scale ecosystems (Longhurst, 1998). En el Ártico encontramos uno de esos márgenes divergentes entre placas a los que se asocia la actividad hidrotermal. El Gakkel Ridge es una extensión de la dorsal medio oceánica más al sur en el Atlantico. Tiene una longitud de unos 1800 km. y cruza el Ártico desde las costa de Groenlandia hasta Siberia (Fig. 2). Como el resto del Ártico, es una de las zonas océanicas menos exploradas por lo que cuál es la importancia de la actividad hidrotermal en todos los procesos que os he comentado más arriba es todavia una pregunta sin contestar. La actividad hidrotermal podría tener implicaciones de mayor importancia aquí debido a que las capas profundas (últimos 2000 metros) están menos estratificadas que en otros océanos. Eso significa que en el Ártico la diferencia de densidad entre agua a diferentes profundidades es menor. Por tanto, nuestras ‘nubes’ de agua hidrotermal podrían ascender más en el Ártico. Ello movería un mayor volumen de agua verticalmente, siendo mayor también su contribución a la circulación de masas de agua profundas en esta cuenca. Por supuesto, el calor liberado al océano a través de la actividad hidrotermal también afectará al calor almacenado en el fondo del Ártico. Así que, estoy encantada de que durante nuestra campana hayamos podido obtener medidas sobre el Gakkel Ridge, y que esos nuevos datos puedan ayudarme a intentar encontrar respuesta a alguna de esas preguntas. Para los que no lo sepan las aguas profundas del Ártico y Mar de Groenlandia son mi objetivo de estudio actualmente. In the Arctic, we find one of these divergent plate boundaries associated with hydrothermal activity. The Gakkel Ridge is an extension of the world-encircling ridge, represented further south in the Atlantic by the mid-Atlantic Ocean Ridge, through the Arctic Ocean. It extends along 1800 km. crossing the Arctic from Greenland to Siberia (Fig. 2). As the rest of the Arctic Ocean, it is one of the less sampled oceanic areas, and so the importance of the Gakkel Ridge hydrothermal activity in all the processes that I explained above is still an open question. The hydrothermal activity in the Arctic could have larger implications than in other basins, because its deeper layers are less stratified than other ocean basins. It means that here the density difference between different depths is smaller. Thus, the hydrothermal ‘plumes’ may reach shallower depths in the Arctic. It would imply a larger vertical movement of water, being also higher its contribution to the circulation of the deep water masses in this basin. Of course, the heat released to the ocean by hydrothermal activity will also affect the heat storage in the deep Arctic Ocean. Thus, I’m really happy and excited with the idea that we have sampled above the Gakkel Ridge, and that these data will help me to give insight in these questions. For those that don’t know, the deep water masses of the Arctic and the Greenland Sea are the aim of my research nowadays. No puedo terminar sin contaros otra cosa más y con esto os prometo que acabo. El Océano Ártico está comunicado con el resto de oceanos desde hace relativamente poco en su historia geológica, no existiendo todavía hoy ningún paso suficientemente profundo como para intercambiar agua a la profundidad en que esta actividad hidrotermal tienen lugar. Por tanto, es esperable que nuevas especies que hayan evolucionado aisladas y se hayan adaptado especialmente a las condiones del Ártico y la actividad hidrotermal estén todavía por descubrir (Edmonds et al., 2003). I can’t finish without telling you one more thing, but with this I finish. I promise. 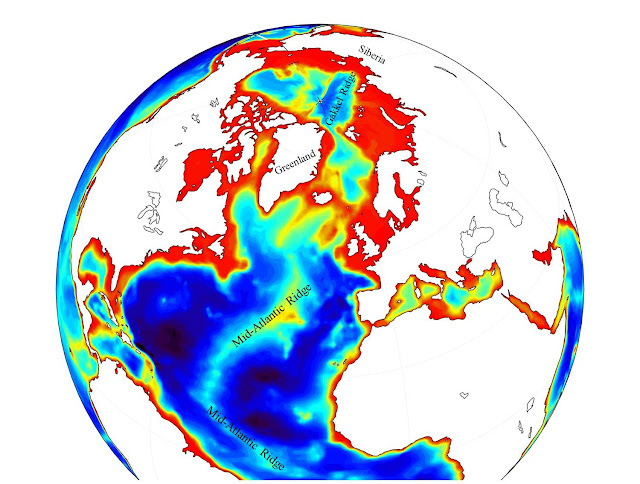 The Arctic Ocean is connected with other ocean basins for relatively little time in its geological history. Besides, there is no opening nowadays deep enough that enables the direct exchange of water at the depth where the hydrothermal activity in the Gakkel Ridge takes place. Thus, we can expect that new species which have evolved in isolation and adapted to the Arctic and hydrothermal vent environments will be discovered here (Edmonds et al., 2003). Longhurst, A. (1998), Ecological Geography of the Sea, Academic Press London. Lupton et al., 1985. Entrainment and vertical transports of deep-ocea water by hydrothermal plumes. Nature, Vol. 316. 1985. Stein et al., 1993.‘Heat flow and hydrothermal circulation‘ in ‘Seafloor Hydrothermal Sytems: Physical, Chemical, Biological and Geological Interactions‘. Geophysical Monograph, 91. American Geophysical Union. Ya casi hemos hecho la mitad de nuestra campana. Hoy comenzamos nuestro viaje de retorno durante las siguientes cinco semanas, desde el Laptev Sea (frente a la costa de Siberia) hacia Bremerhaven (donde vivo ahora y se encuentra la sede del AWI) pasando por el Polo Norte. Los últimos 10 días han sido bastante ajetreados y por eso no he tenido mucho tiempo de contaros lo que iba pasando mientras tanto. Además, la última estación en el hielo no fue muy afortunada para nosotros, las cosas no salieron como esperábamos y, en cierto modo, no creía que tuviese mucho que contaros. Estaba equivocada y eso me ha dado pie a escribir este post. We have almost done half of our cruise in the Arctic. Today, we start our return trip from the Laptev Sea (in front of the Siberian Coast) to Bremerhaven (where I live now and where AWI is located) passing through the North Pole. The last 10 days have been very busy, and, for this reason, I haven’t had plenty of time to write any post for the blog and tell you what was happening during that time. Besides, the last ice-station was not very lucky for us, things didn’t go as we expected, and I thought I didn’t have a lot of things to tell you. I was wrong, and that has given me a theme for this post. Así pues, hoy no solo os voy a hablar de éxitos, de resultados asombrosos y de instrumentos extraordinarios que nos permiten observar cosas que hasta hace poco parecían imposibles sino también de todo el esfuerzo que hay detrás de todos esos resultados, y el que a veces nos olvidamos de mencionar. Thus, today I will not tell you only about big successes, amazing results and/or extraordinary instruments that allow us the observation of processes that until recently we couldn’t imagine. Today, I will tell you also about the effort that is behind all these advances, and that sometimes we forget to mention. Las fotos que tenéis más arriba se corresponden con el material y la colocación de un ITP (Ice-tethered Profiler) en el hielo. Un ITP es CTD (para los que no sepáis lo que es un CTD podéis mirar el post anterior ‘New Eyes to see the Ocean’) perfilador autónomo, lo que significa que es un instrumento que toma perfiles de la columna de agua de manera automática, midiendo temperatura, salinidad y presión como el resto de CTDs, aunque pueden añadirse otros sensores. Para ello, el perfilador va montado sobre un cable de 800 metros de longitud dotado en el fondo de un muerto que lo mantiene vertical y unido en la superficie del hielo a una boya (la boya amarilla que véis en la foto). De este modo, el perfilador realiza unos dos o tres perfiles al día desde unos 800 metros de profundidad hasta la superficie debajo del hielo. Desde la boya en superficie los datos son enviados vía satélite según son tomados. Esto permite conocer como el hielo va derivando en el Ártico -el hielo no se mantiene estático sino que se forma y posteriormente deriva empujado por el viento fuera de éste a través principalmente de Fram Strait- así como las propiedades de las masas de agua debajo de este. La mayoría de las medidas en zonas polares se toman durante los meses de verano cuando la extensión y espesor del hielo permiten realizar campañas oceanográficas. Estos instrumentos permiten obtener medidas durante todo el año que de otra manera no pueden realizarse. Por eso, suponen un gran avance y durante nuestra campana tenemos la intención de colocar 5 instrumentos de este tipo en distintas áreas del Ártico. Nos quedan tres. The photographs that you see above correspond with the material and deployment of an ITP (Ice-tethered Profiler) on the ice. An ITP is an autonomous CTD (for those that don´t know what a CTD is, you can read the previous post ‘New Eyes to see the Ocean’) profiler. It means that this instrument makes profiles of the water column automatically, measuring temperature, salinity and depth as the rest of CTDs, although other sensors can also be installed. 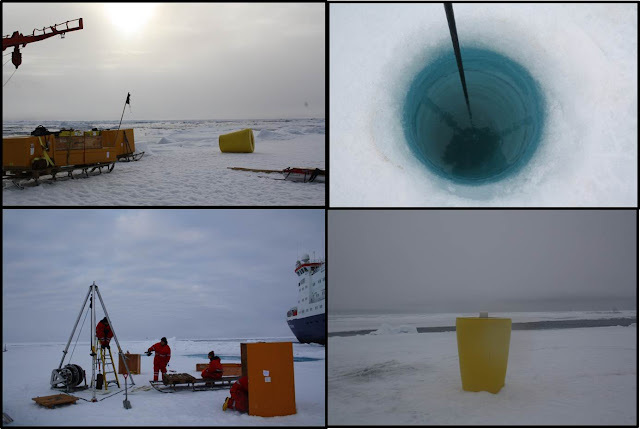 The profiler is mounted over a cable of 800 m. length equipped with a weight at the bottom that maintains the cable vertically orientated and joined to a superficial buoy on the ice surface (the yellow buoy that you see in the photograph). Once it has been installed, the ITP makes two or three profiles per day from 800 meters depth to the surface below the ice. From the surface buoy, the registered data are sent by satellite. It allows knowing how the ice drifts in the Arctic Ocean -the ice is not static, but it forms inside the Arctic Ocean and lately it is transported by the winds out from the Arctic Ocean- and the properties of the water column below the ice. 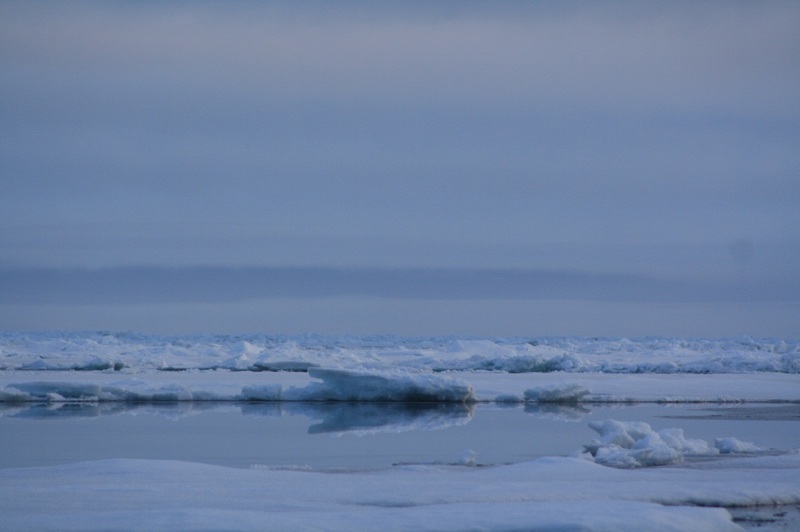 Most of the oceanographic measurements in Polar Regions are taken during summer months when sea ice extension and thickness allow the sampling. These instruments enable to obtain measurements during the whole year that are not possible to be carried out in other way. For this reason, they represent a big advance, and we have the intention to deploy five of this type of instruments during our cruise. We still have to deploy three of them. Como os decía, lo que quiero destacar esta vez no es solo lo que estos instrumentos nos proporcionan sino todo lo que conlleva poner estos aparatos en funcionamiento. As I told you, today I not only want to highlight the ‘goodness’ of these new instruments, but also all the effort involved in putting them into operation. 1- Para empezar debemos mover todo el material al hielo, lo cual no es una nimiedad teniendo en cuenta que todo junto pesa alrededor de una tonelada. Arriba a la izda. en la foto veis la mayoría del material necesario para colocar uno en sus distintas cajas. First, we must move all the material onto the ice, which is not a triviality considering that all together weighs within 1 ton. Above, on the top-left corner photograph, you can see most of the material that we need for an ITP deployment. 2- Después hay que montar todo el material auxiliar para poder desplegar el cable de 800 metros, colocar el perfilador y la boya en superficie. Previamente habremos hecho un agujero en el hielo de unos 3 metros de profundidad. Pueden ser 2 ó 4.5 metros dependiendo del espesor del hielo. Como veis en la foto de abajo a la izda. tampoco es un juego de niños. Todo lo que veis ahí, estaba inicialmente dentro de las cajas. Later, we must assemble all the auxiliary material that enables to lay out the 800 m. of cable together with the weight in the bottom, the deployment of the profiler, and the surface buoy. 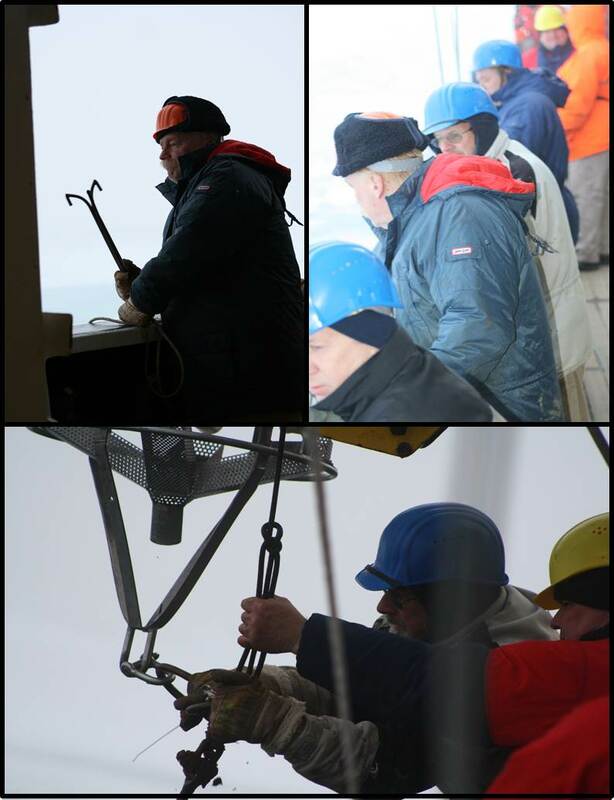 Previously, we will have done a hole in the ice of three meters depth on average. It can be 2 or 4.5 depending on the ice thickness. As you see in the photograph in the bottom-left corner, it’s neither a child’s game. All that you see there were initially inside the boxes. 3- Una vez colocado todo, se comprueba que el perfilador funciona, se vuelve a meter todo el material auxiliary en las cajas, de manera que cuando nos vamos solo la boya de superficie que veis en la foto de arriba a la dcha. indica que hemos estado ahí y colocado un ITP. Once the ITP has been deployed, a test is carried out to check its performance. 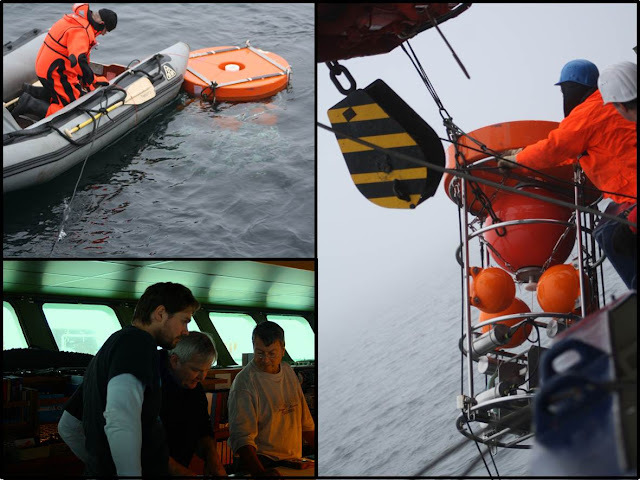 Then, all the auxiliary material is put again inside the boxes, in such a way that when we leave only the presence of the surface buoy indicates that we have been there, and that an ITP is deployed there (photograph in the top-right corner). 4- ¿Y qué pasa si el perfilador no funciona? Pues hay que volver a recoger los 800 metros de cable en el tambor, recuperar el perfilador con su muerto de 150 kilos, guardar la tonelada de material de nuevo en sus cajas y volver con todo al barco. A veces pasa, pero este esfuerzo es necesario para obtener todos estos nuevos datos que después están a disposición de toda la comunidad científica y del público en general, lo cual hace ese trabajo aún más merecedor de ese esfuerzo. And…what happens if the profiler doesn’t work? Well, then, we must to put the 800 meters of cable again in the winch; to recover the profiler and the weight at the bottom; and to keep the ton of material again in their boxes, and return it to the ship. Sometimes, this kind of things happens, but this effort is necessary to obtain these new data that later will be available for all the scientific community and the general public. It makes this work even more worthy of this effort. Y todo esto me da pie a hablar de otro trabajo que también pasa desapercibido para el público; bueno, eso considerando que nuestro trabajo como oceanógrafos es sobradamente conocido ;-). Ese es el trabajo de los miembros de la tripulación de los barcos oceanográficos. Para prácticamente todo lo que realizamos a bordo durante una campana necesitamos su ayuda. Sin ellos, cualquier cosa que quisiésemos realizar sería mil veces más complicada, suponiendo que consiguiésemos llegar a hacerla. Es increíble a la velocidad que pueden hacer y deshacer nudos, manejar tornos, desplegar zodiacs en el agua y recogerlas, o hacer con el barco y su navegación lo que nosotros queramos o necesitemos. Incluso disponemos de un helicóptero con el que con la ayuda de los pilotos y el resto de personal podemos hacer incluso más cosas, o intentarlas de manera diferente, por si todo lo hecho en el barco no fuese suficiente. Hoy en lugar de fotos del hielo, os dejo algunas fotos de ellos. Overall, it has made me think in other work that also goes unnoticed for the public; of course, this considering that our work as oceanographers is well known ;-). This is the work of the members of the crew of a research vessel. For almost everything that we do onboard, we need their help. Without them any task would be thousand times more difficult, assuming that we would be able to do in such case. It’s incredible how fast they can do and undo knots, to operate the winch, to put zodiacs in and out of the water, and make with the ship and its navigation anything that we need. Even, we dispose of two helicopters with which we can try alternative maneuvers to all the previous done onboard with the help of the pilots. Today, instead of ice photos, I leave you photos of some of them.